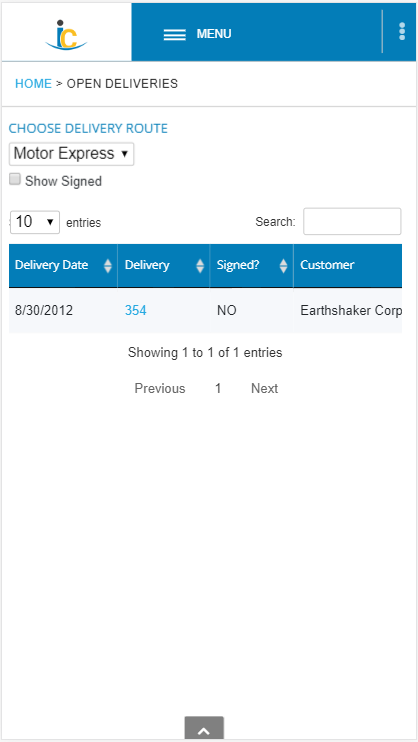 Signature Capture for Employee Portal allows delivery drivers to accept customer signatures at the point of delivery. Some configuration (outlined below) is required to enable this optional feature. Each Employee user must have the “Deliveries” role (applied in B1) and must have an assigned named Sales User license (applied within InterConnect Server Tools). For a walkthrough of applying user roles, see Employee User Configuration. For a walkthrough of applying a Sales User license, see Assigning Licenses. Users with the “Deliveries” role, will be able to access all signature-capture functionality. To set Signature Capture configuration options, navigate to: InterConnect Manager AddOn > Administration > Employee Portal Config > Sales User tab. 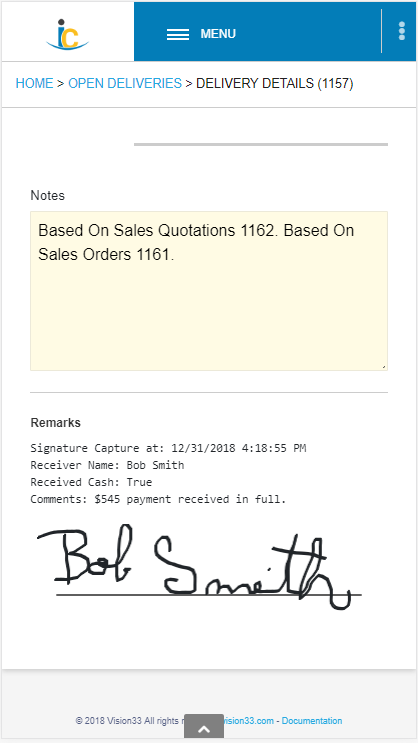 Signature Capture must be enabled, otherwise, signatures will not be visible on the delivery details page. 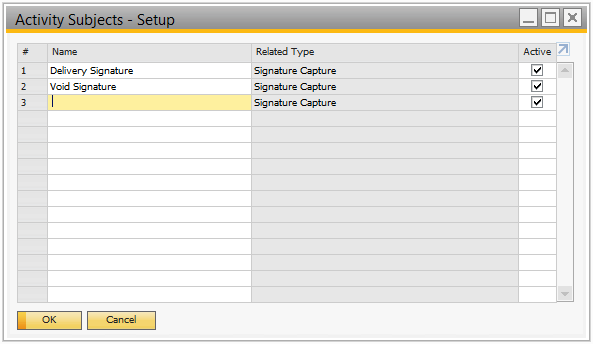 To enable Signature Capture, set the global configuration option “Enable Signature On Deliveries”. Delivery drivers may accept Cash On Delivery (COD) payment at time of delivery, along with Signature Capture. To enable this feature, set the global configuration option “Enable Accept Cash Payments”. Activities are used to capture the signature and associate it with the Delivery. 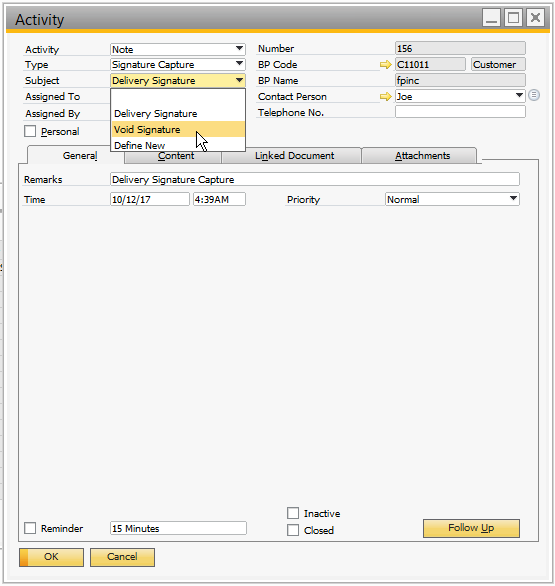 Activity Type and Activity Subject are required before a signature can be captured on a delivery. 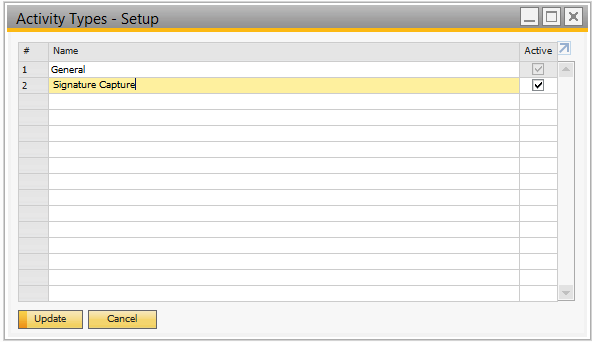 Once they are configured, they can be assigned in the Activity Type and Default Subject drop-downs. 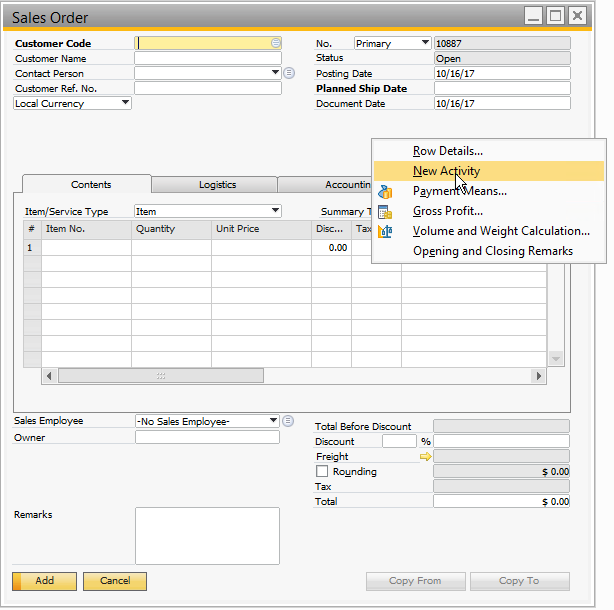 On a blank Sales Order screen, right-click below the header and open “New Activity”. Right-click below the header, and press New Activity. Under “Type”, select the option “Define New”. Alternatively, an existing Activity Type may be used - in this case, skip the following step. In the Type drop-down, select Define New. In the Activity Types window, create a Signature Capture option. This will allow for easy identification of Signature Capture activities. Note that a new Activity Type is not required. Another existing Activity Type may be used, or a new Activity Type may be created with another name. Create a new Activity Type called Signature Capture. Under “Subject”, select the option “Define New”. In the Subject drop-down, select Define New. In the Activity Subjects window, create a Delivery Signature option and Void Signature option. This will allow for easy identification of the Signature Capture activities as well as activities for signatures that turn out to be invalid. Note that a new Activity Subjects are strongly recommended, but are not required. A unique Activity Subject allows for easy identification of an activity’s purpose. Additional Subjects can be used for back-office processes (for example, manual audits at a later date), which are separate from the signatures themselves. Define a new subject to identify Delivery Signatures. The Activity Type and Activity Subject are now created. Cancel out of all open windows. Apply Activity Type and Activity Subject in InterConnect Manager Add-On (InterConnect Manager AddOn > Administration > Employee Portal Config > Sales User). Apply configured Activity Type and Activity Subject to Sales User configuration. 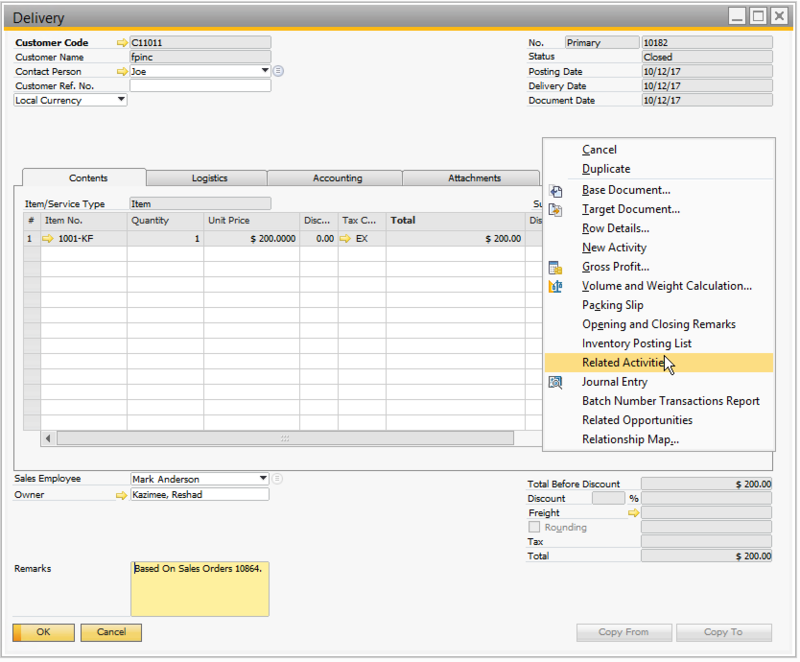 By default, Deliveries are grouped based on Shipping Methods within SAP Business One. In this case, no further configuration is required. If routes are not based on Shipping Methods, then the Deliveries report will need to be modified with an implementation customization. Modify the “Scheduled Deliveries” report found in the query category B1WebAPI_QueryPortal > DeliveryReport. This must be customized as described in the Scheduled Deliveries Query section on the right-hand side of the add-on window. 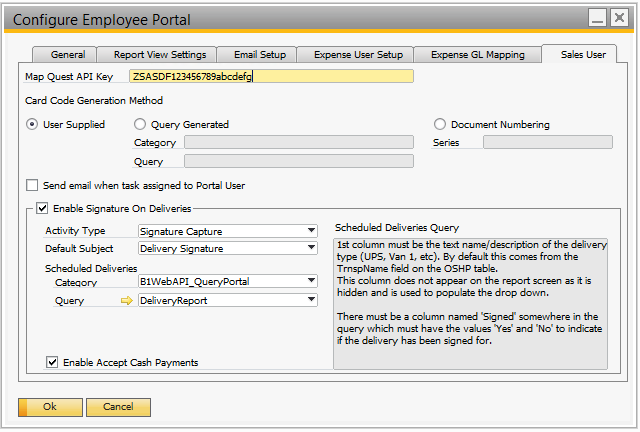 Follow the instructions on the right-hand pane for description of customizing the Scheduled Deliveries Query. At a high-level, Signature Capture displays open deliveries assigned to a specific delivery driver. A driver can proceed through the list of open deliveries and capture signatures on site with the customer. Prior to delivery, an admin must assign the delivery to the delivery driver’s sales person. This allows the delivery driver to see the delivery in their list. Delivery driver views a route using the “Delivery Details” report. Open the Delivery Details report link to view today's deliveries. At the point of delivery, the delivery driver opens the current delivery details document using the “Delivery Details” report. Open the current delivery link to view Delivery Details. 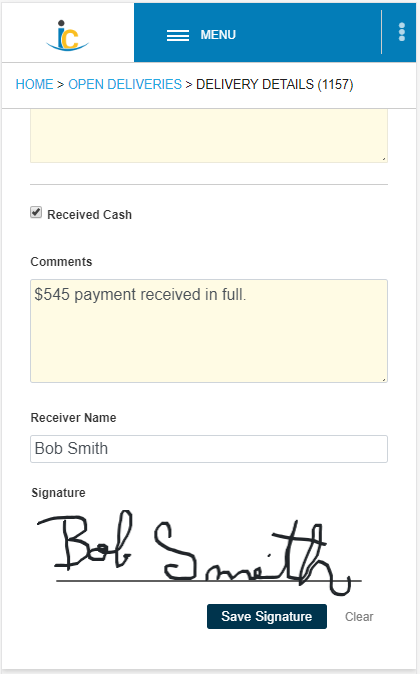 The customer signs for their order using the signature capture on the delivery details page. The customer signs and saves the signature. Once saved, the signature is permanently associated with the delivery. Back-office staff can view the signed delivery and see any additional details such as whether COD was accepted. This is saved on the Delivery document as an activity with the Remarks “Delivery Signature Capture” and the configured Activity Type and Subject for signature capture. The recommended Activity Type is “Signature Capture” and recommended Activity Subject is “Delivery Signature”, although this may be configured differently. On the delivery, right-click and view Related Activities; Open the Signature Capture activity; View details, including associated signature image. 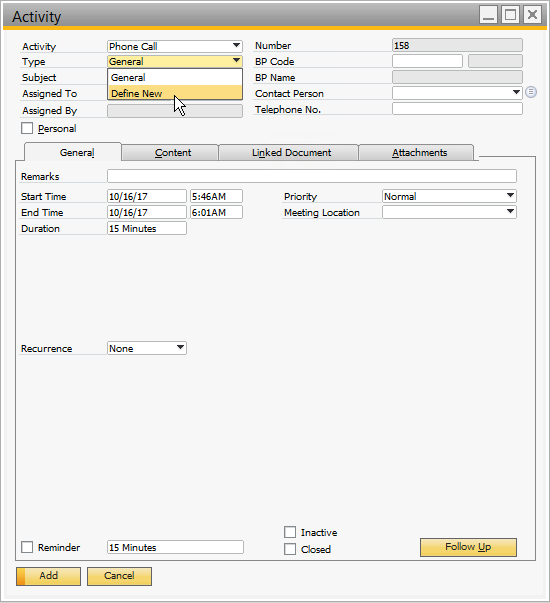 In SAP Business One, open the delivery document. On the delivery, right-click the header and select Related Activities. 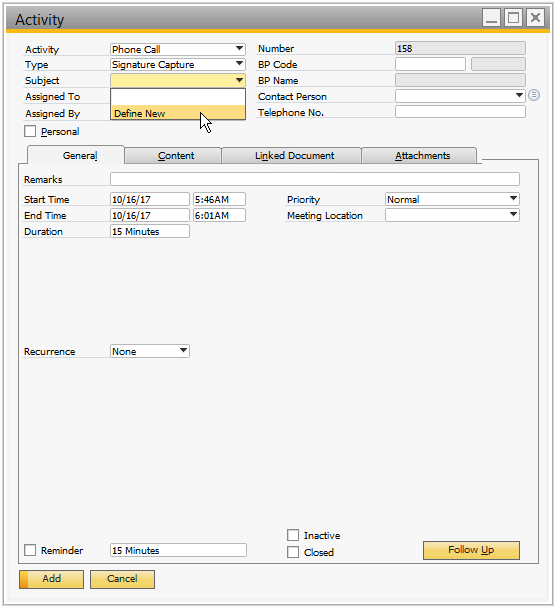 Open the Signature Capture activity, indicated by “Delivery Signature Capture” in the Remarks field. General tab: View general details, including the Remarks that this Activity is for Signature Capture. Content tab: View any remarks and specific details such as date/time of the signature. Attachments tab: Displays a document path to the signature image file. Double-click on a link to see the image in a viewer, similar to the screenshot shown above. From time-to-time, an error may occur in the field, where a Delivery driver captures the incorrect signature for a delivery. In this case, a back-office process must be applied to identify these signatures as a “Void Signature”. This can be done by modifying the signature’s activity and applying a different subject. In SAP Business One, open the delivery whose signature is invalid. Right-click on the document header and select Related Activities. Open the desired activity. An activity that is related to Signature Capture will have the Remarks “Delivery Signature Capture”. Open the Signature Capture activity. Set the Subject to “Void Signature”. This will identify the activity as no longer relevant. Please note that this does not impact the front-end display of signatures. If a signature has been applied, it will always be visible from the web. Set the subject to Void Signature to identify it as invalid.